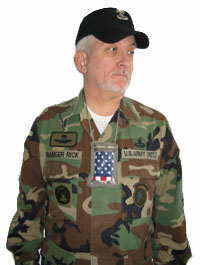 Note: Developed in honor of the 173 rd Airborne "Recon/Scout Platoons" down range in Afghn (2010). When you join the Army, Navy, Marines or Air Force, unless you're a pilot or a member of an elite special operations unit you won't be issued a personal military survival kit. Why? Because they are only issued to those who operate behind enemy lines and in remote & isolated areas of the world far from civilizations. 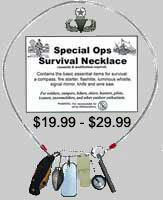 And if you're not a pilot or a member of a special ops unit, does this mean you don't need a personal survival kit? Absolutely not! 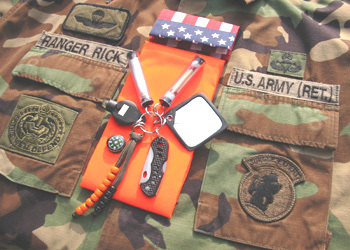 In fact whether you're assigned to a conventional unit (infantry, armor, transportation, etc) or an unconventional unit (Special Forces, Ranger, etc), regardless of your MOS you should still pack & carry a person survival kit. 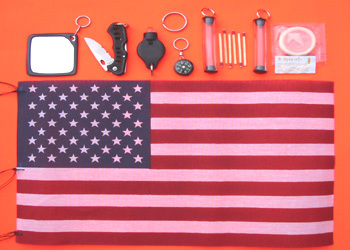 What should a personal military survival kit contain? Well it depends on two things; (a) the type of terrain, weather & environment you'll be operating in and (b) your knowledge, skills & experience in knowing how to survive in the outdoors. And so as a general rule; the more experience & knowledge you have in survival - the less items you need. But the less experience & knowledge, the more survival items you should pack & carry. Make sense? You betcha. 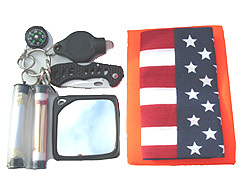 Where should a survival kit be carried? The best place is somewhere close and near your body like in one of your shirt or pants pockets or attached to your belt. Why? So in the event you have to ditch & drop your ruck and or some other military gear you will still have your survival kit on you. Again, make sense? Yep, sure does. Though pilots, aircrews and special operation forces need to pack & carry a vast assortment of survival gear so they'll be prepared for almost any type of environment. The following is a basic list of items all soldiers regardless of their MOS should pack & carry in their own personal survival kit. 1. General Direction Compass - Can't tell directions by looking up at the sun, stars, and moon? Well neither can most other people, and so that's why it's best to pack & carry a simple general direction compass. Better to know what general direction you're heading in and which way is it to friendly (or enemy) lines than to wander around aimlessly in circles and risk being found by some hostile forces instead of friendly forces. 2. Signal Mirror - While military issued signal mirrors with the "peep holes" are more accurate in signaling someone at great ranges. The average soldier has a difficult time locating the sun or what is commonly referred to as the "fire ball" when looking through these signal mirror peep holes. Therefore the easiest and fastest way to signal someone with any type of mirror with or without a peep hole is to; (a) extend one arm out, (b) form a "V" with two of your fingers, (c) place the target you want to signal between these two fingers, and (d) reflect the sunlight first onto your arm and then up through the "V" and the reflected sunlight should be seen by the target. 3. Orange Signal Panel - No matter what type of terrain and vegetation you are operating in, almost anything that is "bright orange" will surely stand out and catch someone's wandering eye, whether they're on foot, in a vehicle or in a low flying aircraft. Even if it's just a simple inexpensive 20 x 20 inch florescent orange handkerchief or bandanna. 4. Friend or Foe ID Flag - Should you become lost or separated from your unit, when approuching friendly lines or a friendly patrol it's best to carry something that will quickly identify yourself as a "friend" and not a foe. And there's nothing more recognizable than to carry & wave a small 12 x 8 inch Amerian flag. Better to wave a small American flag then a "white flag" and risk being shot at and mistaken for a foe by your own troops. Ya know? 5. Fire Starter - Unlike pilots, aircrew and special operation forces who are all trained in the art of survival and fire making. The average soldier knows nothing or very little about survival and in how to start and maintain a fire. Therefore those who lack this skill and experience should pack & carry the easiet to use fire starter in the event of a survival emergency. And out of all the fire starters there are on the market, the easiest fire starter to use are the "strike anywhere" wooden matches. And only when you have become more experienced and proficient in knowing how to start fires is when you should pack & carry a flint & steel or a magnesium, flint & steel fire starter. 6. Small LED Flashlite - Don't have "cat eyes" night vision capabilities? Well neither does anyone else, and so that's why it's a no brainer and a "must have" survival item to pack & carry along with a few extra spare batteries. 7. 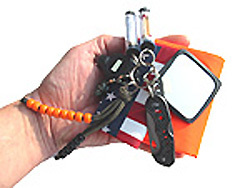 Small Pocket Knife - Already own and carry a big ol' Rambo knife? Well it doesn't hurt to pack & carry a small backup. Better to have two instead of one knife just in case you accidentially drop and lose your main knife. You never know. 8. Water Container & Tablets - Believe it or not, some of the survival items that WWII pilots use to carry in their survival kits way back in 1944 are still packed & carried in today's military survival kits. Like condoms. As they make great lightweight and collapsible water containers, besides another use. 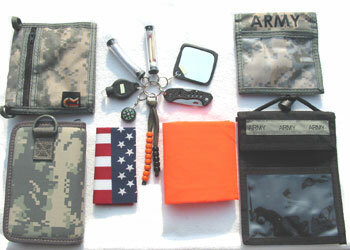 These are just a few of the basic "must have" survival items all soldiers should pack & carry in their personal kit just in case they find themselves lost or separated from their unit down range in "bad guy" land. What should these items be carried in? Well definitely not in one of those tin can or plastic storage containers as they could make some unwanted rattling noise while moving around in hostile terrority. So instead it's best to pack & carry them inside a soft military pouch or wallet so they won't make any noise and will be easier to store inside your pocket or on your belt. Remember.Better to pack & carry a few survival items and maybe never having to use them than not to have any at all and wished you had. Some good advice? You betcha! 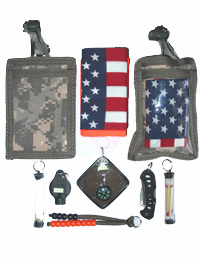 January 2010 - The SMA Survival Kit was developed in honor of the 173 rd Airborne "Recon / Scout Platoons" in Afghn. 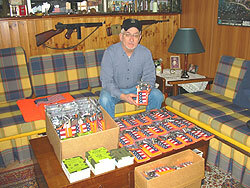 Which after my wife (Silvia) and I spent several days assembling these 50+ SMA Kits so we could donate and forward them to every member of the ½ Bns 503 rd Airborne "Recon / Scout Platoons. I then wrote a letter to Maj.Gen. William B.Garrett III, the CG of SETAF/AFRICOM, asking him if he could please provide us the mailing address. But after waiting for more than a month and never receiving a reply back. I then contacted someone else with less rank, a sergeant who was more than happy to help us get these SMA Survival Kits in the hands of the 503 rd Recon / Scout Platoons in Afghn. But then two months later, low & behold who finally contacts me? Some officer on Maj.Gen Garrett's staff and he said.. " Unfortunately, after having our legal team conduct a review we are not able to accept them on the condition that they are to go only to Recon Platoons..."
Well sir, you're two months late and a dollar short, they've already been shipped off and arrived in the hands of those Recon Scout members down range in Afghn. 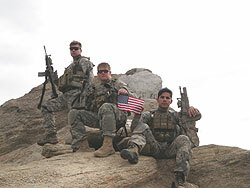 See below one of several photos that I have received back from some of these "thankful" Recon Scout platoon members. Come Visit Me On Facebook! Click Here!